How to re-plant an orchid? When your plant outgrows the pot, you can upgrade to a larger size, and reuse the old one WITH THE SMALLER ORCHIDS. 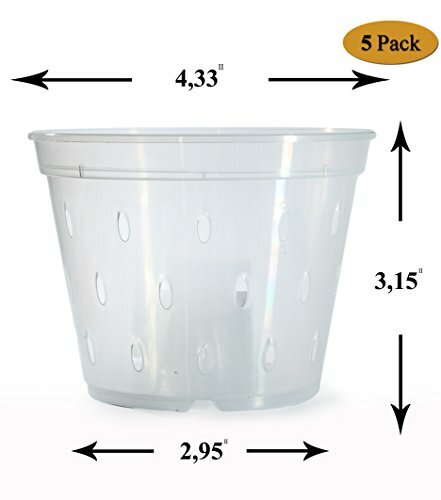 The durable plastic is well suited for easy washing and repeated use. DAN Market Pots are designed for ORCHIDS to thrive. The durable construction should provide years of satisfaction and successful results. Suitable for all types of orchids: mini and midi phalaenopsis. PREMIUM Orchid Pots - PERFECT GIFT IDEA! CLICK the Add to Cart Button to Order NOW! Well suited when buying orchid potting mix, orchid fertilizer, orchid food for your orchid. SLOTTED and BREATHABLE DAN Market transparent orchid pots allow air into roots to promote more efficient plant growth through AERIFICATION. Click Add to Cart and let's get growing orchid roots. CLEAR pots allow control the well-being of the orchid ROOTS. DAN Market small wide orchid pots ensure PROPER DRAINAGE - pots have HOLES in the base and SLITS on the sides to increase drainage. Durable construction DAN Market orchid pots should provide years of satisfaction with proper use. 4.33 inches diameter to 2.95 inches diameter at the bottom , height 3.15 inches . 5 Pack. If you have any questions about this product by DAN Market, contact us by completing and submitting the form below. If you are looking for a specif part number, please include it with your message.